It is very much a national peculiarity, but we English do love a good underdog. For those unfamiliar with the term, it describes someone who steps up to the fight knowing that they are likely to lose, but gets on with it anyway. However, history tells us that in every generation there are a special few who are made of stronger stuff. They give their all and win the fight, but end up dying in the process. Take Lord Nelson for example, already a national hero through fighting in the Napoleonic wars, he immortalised himself by dying at the brink of victory during the battle of Trafalgar. What makes his accomplishments all the more heroic is that throughout his career as a naval officer, he suffered from ongoing chronic seasickness! Unknown to many of us we had rejoiced in heroism like this before, but unlike Nelson the name has not been engraved in the national psyche. The significance of this can only be described as a travesty of justice because in his time he was perhaps one of the most famous men the world had ever seen. And the name of this forgotten fallen hero? 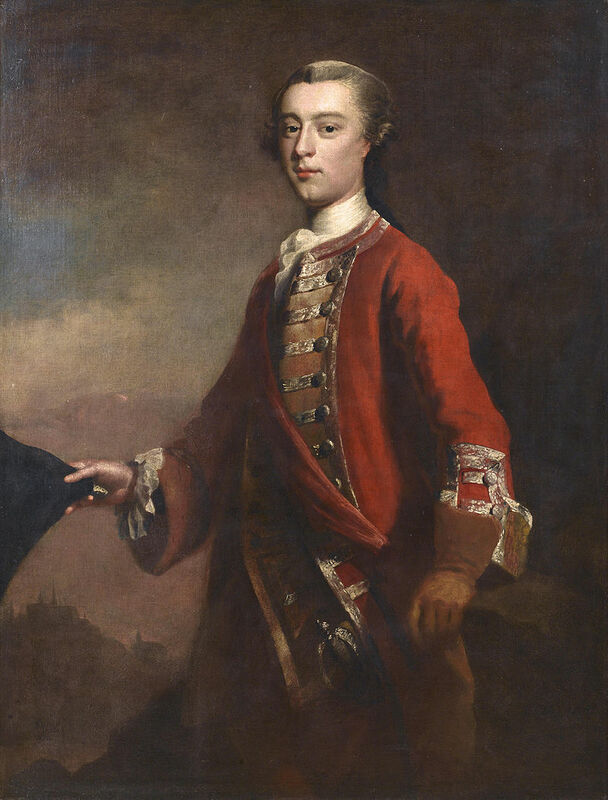 James Wolfe the ‘The Hero of Louisbourg’ and the man singularly responsible for defeating the French bringing Canada under British rule. His story begins in the beautiful Kentish village of Westerham, much of which remains the same as it was in Wolfe’s day. The eldest son of Henrietta and Edward, his father was a lieutenant colonel in the British army serving under the Duke of Marlborough. From the moment he was born on 2nd January 1727 he had already received his first lessons on the hardships army life. Being on active duty his father was unable to attend the birth. The result of which meant that instead of being at the family home of Spiers (later known as Quebec House) his mother gave birth over the road in the vicarage. It was unfortunate timing as she was only staying to enjoy a little company. Later that year the he was baptised in St. Mary’s, a beautiful 14th century parish church that stands on rising ground just behind the family home. Although no longer used, the old stone font used to christen James Wolfe can still be seen to this day. He was considered frail as a child, but was still very much his father’s son. He proved this by following in his footsteps and joining the Duke of Marlborough’s regiment of marines at the tender age of 13. Working hard he received his first commission as second lieutenant at 14. He proved himself to be a determined and gifted career soldier, but like many of his compatriots he took a rather dim view of the men under his command. Acknowledged as a brilliant trainer of infantry he managed to win their loyalty and obedience by introducing his own highly effective measures for training and discipline. Best known for the alternate firing and bayonet system, he reinforced these ideas by the new concept of regular parade ground drilling. This system subsequently provided the foundation of British infantry tactics in the American War of Independence and was further built upon in the Napoleonic wars. Along with a strong interest in his soldiers welfare he was very much ahead of his time and this enabled him to accomplish victories when less enlightened leaders would have failed. The year of 1758 saw the first of his most memorable victories. Having reached the lofty rank of brigadier-general, Wolfe was charged with leading an assault against the great sea fortress of Louisbourg. His forces sailed under the cover of darkness along the coast from their base at Halifax, Nova Scotia, but heavy fog had settled into the bay forcing them to an agonizing delay of almost a week. Finally the fog lifted and the troops followed Wolfe into Freshwater cove, not only one of the most inhospitable shores in the world, but one that was also under a strong French defense. Fortunately the British had luck on their side and, even though they were under fire from the French, a small band of sailors managed to land and secure a beachhead. 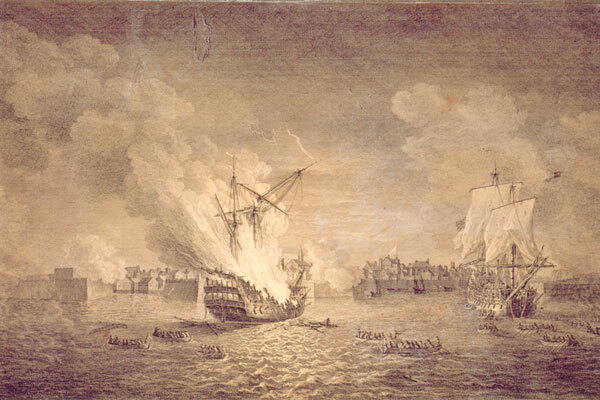 British ships began firing on those of the French which were still anchored in the bay. By chance, a lucky shot hit a French gunpowder store which in turn set fire to stationary French warships. It wasn’t long before the anchored fleet became nothing more than a gigantic fireball. 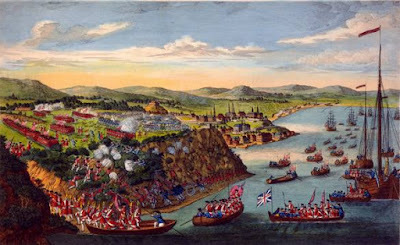 The victory at Louisbourg was vitally important to the British command as it effectively cut off both French supplies and their reinforcements allowing the British forces to sail down the St. Lawrence River to Quebec unimpeded. The victory at Louisbourg was only one element in a three part strategy to capture Quebec, the last real French stronghold in North America. But with winter closing in, the final attack on Quebec had to be delayed. Unfortunately for General Wolfe poor health had been a constant companion throughout his life. Throughout this time he was suffering from tuberculosis and kidney failure, but the demands of battle were making him weaker still. He decided to take this opportunity to return to England and spend some time convalescing in the ancient Roman spa town of Bath. When he arrived in England news had already spread and he found himself to be already famous. It was at this time he became known as ‘The hero of Louisbourg’. 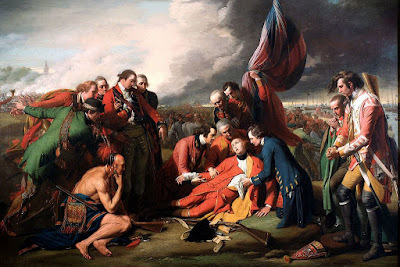 William Pitt, the then British Prime Minister, arranged for a meeting with James Wolfe and, suitably impressed, gave Wolfe command of the forthcoming Quebec assault force. In June 1759, the stage was set and Wolfe, along with 9000 men, sailed up the St Lawrence River towards the treacherous cliff face of Quebec. He landed unopposed on the Island of Orleans, placing them virtually opposite the French position who had been expecting attacks from Lake Ontario in the West and Lake Champlain in the South. Wolfe’s new battle plan was beginning to come together, especially as his arrival along the St Lawrence had taken the French by surprise. At midnight on the 28th June, seven ships were witnessed to be sailing towards the British position. They were French fireships and their aim was to destroy the British fleet. Their burning hulls lit up the sky on that warm summer’s night but a miscalculation by the French commander had made him give the order to ignite them too soon. 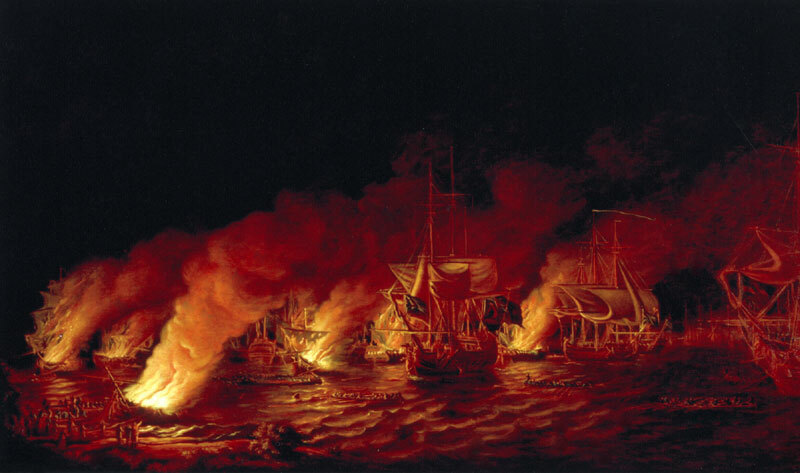 The fireships were easily spotted by the British sentries and subsequently held off, leaving them to burn harmlessly by the shore. On 31st July 1759 Wolfe attempted a direct attack on his opponent the Marquis de Montcalm on his riverside fortifications at Beaumont, but the land was too well protected and it failed. An even greater disaster followed when a landing was made on the Falls of Montgomery. Over 400 of Wolf’s men died in the final attack forcing the British to withdraw. Wolfe’s plan to siege Quebec was beginning to falter. Unused to failure and suffering once more with failing health, Wolfe was becoming desperate to finish the campaign before the oncoming winter. After heavy consultations with the fleets’ admiral and his own brigadiers, a brilliant final plan was formed. With echoes of Alexander the Great he sent out reconnaissance to find a way up the unscalable cliffs to the west of the fortress. Incredibly Wolfe’s luck returned and a path was found at the base of Anse au Foulon (now known as Wolfe’s Cove), but there was a problem. The cliff path was no wider than two men standing abreast making it an extremely dangerous climb, but if Wolfe’s plan had any chance to succeed then his men had to make the ascent at night! On 12th September Wolfe received intelligence that French supply ships were going to venture down the St Lawrence under the cover of darkness. In fear of their plan being discovered it was decided to feign an attack on Montcalm’s fortifications east of the city. They hoped that this would have the effect of drawing the French commander’s attention away from the proposed landing site. If the deception proved successful then it would also present Wolfe with an unexpected opportunity, tipping the balance in favour of the British! It was close to midnight when the English troops embarked in their small boats, taking advantage of a turning tide they began their three hour passage to Anse au Foulon. It was now that the earlier intelligence report was used to their gain. Although the French sentries who lined the route challenged the British advanced party they were answered by a by a highland officer who spoke fluent French. He was able to convince them they were the expected French supply ships enabling the force to land virtually without incident. Within two hours Wolfe had a force of 4828 men on top of the cliffs, but what was more astounding was that he was even able to bring up some artillery! As the morning sun rose over the open ground, the British troops prepared for battle and once again the French were caught completely by surprise. Montcalm only become aware of the British incursion when he saw their lines forming in the distance. Certain that Wolfe could only have a token force at the cliff tops, he refused to wait the two hours it would take for his troops to return from the west. Instead he attacked Wolfe with the garrison at Quebec, made up of French, Canadian, and native Indians. They streamed through the city towards the British lines held at the Plains of Abraham. Montcalm immediately applied to the city’s’ governor for some of the guns from the ramparts, but only three of them were released. Nevertheless, Montcalm was still determined to reach the British before they had a chance to properly dig in so he called for an immediate attack. It was 9.30 in the morning when the French were first ordered to advance, but they were excitable and poorly discipline. With no return fire from the British they sensed victory and began to run towards their lines firing prematurely. It wasn’t long before the French attack began to loose its cohesion. Wolfs forces, instilled with his legendary parade ground discipline, waited until the enemy was only 40 yards away before they fired off a single, deadly volley from their Brown Bess muskets. As Montcalm’s army broke and fled, a second volley was released which all but destroyed the French line. With typical disregard for his own safety he joined his men in the thick of the fighting. Unfortunately, he chose to wear the scarlet coat of the Grenadiers making him an easy target for French marksmen. He was only there a few minutes before receiving an shot which shattered the bones in his wrist. This was quickly followed by a second that caught him in the groin. Incredibly, he remained on the battlefield until hit by a third shot that lodged deep within his chest. The pain must have been agonizing and no longer able to command two men were called to support him back behind the British lines. Wolfe’s final orders were this “... go to Colonel Burton – tell him to march Webb’s regiment down to St. Charles River to cut off their retreat from the bridge…” Turning on his side he then added “...Now God be praised, I will die in peace...” And so, victorious in battle, ended the life of one of England’s greatest military geniuses. 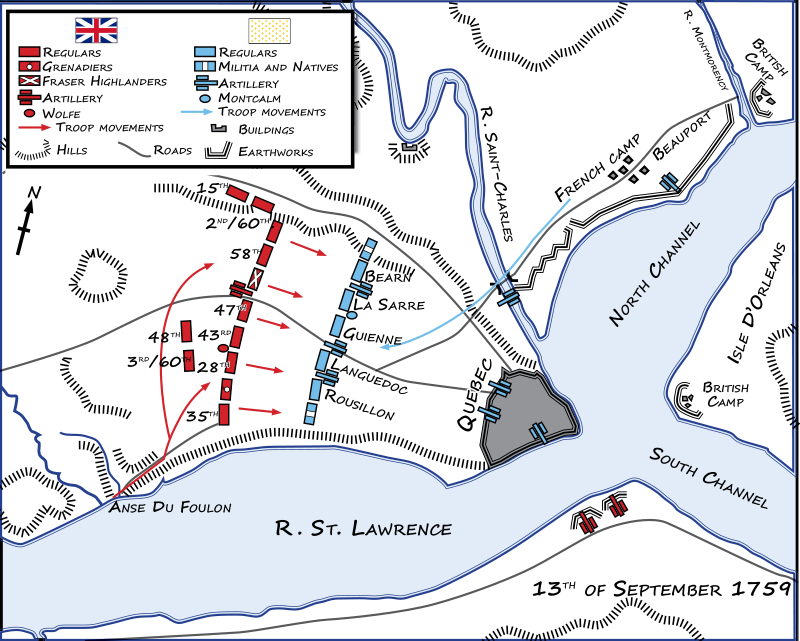 Canadian forces, under command of the French, continued to fire on the British until they too were driven back. Meanwhile, the French army retreated back into the city amidst the confusion. 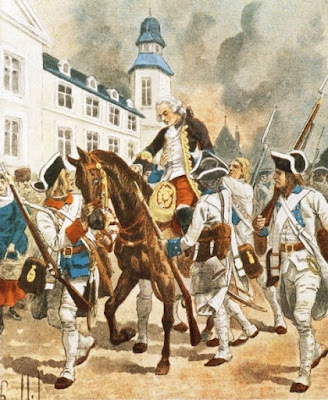 The Marquis de Montcalm, who also made himself out to be an outstanding target, was mortally wounded by foolishly riding along the front lines. 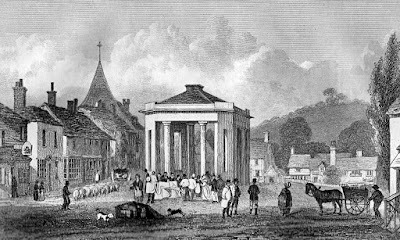 He was carried back to the city by a crowd of fugitives and taken to the Ursuline Convent hospital. It was around 4 o'clock in the morning on the 14th September when he died, just 24 hours after the British first set foot at Anse au Foulon. The city of Quebec surrendered four days later. History tells us that both Wolfe and Montcalm were killed in the battle, both surviving to know the outcome. It was the very nature of this battle and his death at the moment of victory, which made Wolfe a national hero. The news of his death was received with mourning across the whole of Britain and his services to his country were rewarded by a monument erected in Westminster Abbey. However, the tremendous bravery and tactical brilliance of the man would have counted for nothing without his extraordinary knack for having luck on his side. If Montcalm hadn’t blundered into an early attack, Wolfe’s forces would have been crushed and his reputation would have turned out very different. And so to conclude, it’s because of this very reason why Wolfe possesses all the qualities necessary to hold the title as one of England’s greatest underdogs. Long may he be remembered. Wolfe and his 9,000 men were able to sail up the St Lawrence because it had been impeccably charted by James Cook. Cook's accomplishments there, and subsequently in charting the coast of Newfoundland, drew the attention of the Admiralty and led to his being given command of the Endeavour, which Cook used to convey Joseph Banks on his botanical tour of the Pacific. So this story has has a strong, if slightly cryptic, connection to gardening.